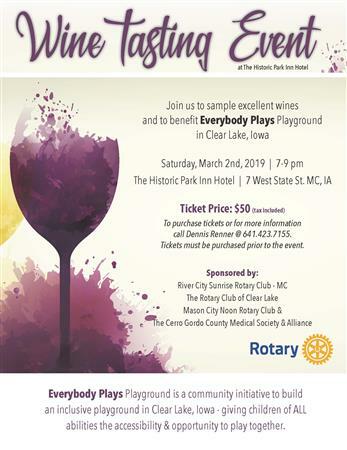 Join the River City Sunrise Rotary Club -MC, the Rotary Club of Clear Lake, the Mason City Noon Rotary Club, and the Cerro Gordo County Medical Society & Alliance for a Wine Tasting Event to benefit Everybody Plays Playground in Clear Lake Iowa. The event will be held at the Historic Park Inn Hotel, 7 West State St., Mason City on March 2, 2019 from 7:00 p.m. to 9:00 p.m.
To purchase tickets or for more information call Dennis Renner @641.423.7155. Tickets must be purchased prior to the event.